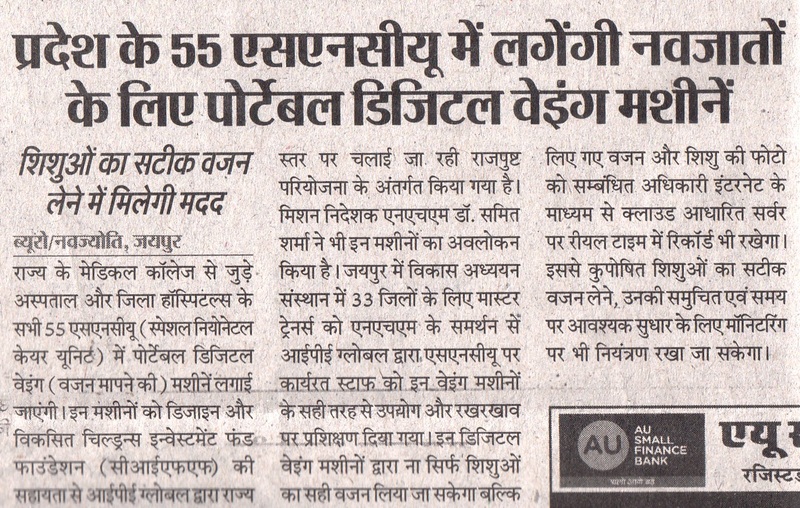 With the support of Children Investment Fund Foundation (CIFF) under the state level Rajpusht program being implemented by IPE Global, portable digital weighing machines will be installed in 55 SNCU’s (Special Newborn Care Units) within the medical colleges and district hospitals in Rajasthan state. The digital weighing machine would not just capture actual weight of the infants but will also ensure that the measured weight along with the digital photograph of the infant is uploaded via internet on the cloud-based server by the concerned official at the facility. This would allow accurate weight management, adherence of complete and proper care protocol as well as monitoring of the entire care process for the underweight and malnourished infants.